On a spooky foggy night in an old Airstream camper, I sat under a single lamp, just chilling. 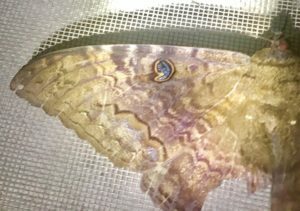 Then, I was joined by a giant moth, clearly sporting a 9 on its wing. I don’t know how the moth got inside, but it chose to land directly above me on the overhead vent screen. And it posed for a photo op. My fourth grade report card had a note from the teacher to my parents. The teacher’s prophecy still holds. And yet. I fell in love with a number because of the way it works. In a required college math course, the teacher explained that when you add together the digits in some number, and keep doing it until you reach a single digit, that number is called the digital root. Say, 346257. 3+4+6+2+5+7=27, and 2+7=9. Now, she said, do the multiplication tables with a 9—times any number. The digital root of the product always adds up to a 9. Try it. It boggles my mind even more that multiplying 99, or 999, or 9999…times any number has a digital root of 9. Crazier still, to me, is if either of two multipliers has a digital root of 9, the product has a digital root of 9. Like 72×3=216, and 2+1+6=9. Or, 324×902=292,248, and (yes) those numbers add to 27, which reduces to 9. It doesn’t work that way with any other number. Not 2s, 3s, 4s, 5s, 6s, 7s, or 8s. The weird behavior of a 9 makes me love the number. But I love a 9 even more because it has showed up in my life in meaningful ways. Two examples: the address of my Over the Transom Bookstore was 9 North Church Street; and the address of the Wolff Writers’ Cottage is 9 North School Street. The latter is the address of a non-profit I founded called the Fairhope Center for Writing Arts, a little bungalow to use as a retreat for writers-in-residence. When the site was chosen, the address of the abandoned building was unknown. I also love the shape of a 9. Make a big 9 in the air with your finger. Do a single line starting with the tail, or start with the head. See? So, of course, I decided to include 99 poems in this chapbook. With each haiku having seventeen syllables, that’s a thousand, six hundred and eighty-three syllables, of which number the digital root is 9. How does that work? I’m still not a math head. But at least the number 9’s got a piece of my heart. But I love them still. Thrilled to hear from you again. I thought either you or I were lost in this new world!! Thank you again for sharing you many thoughts!